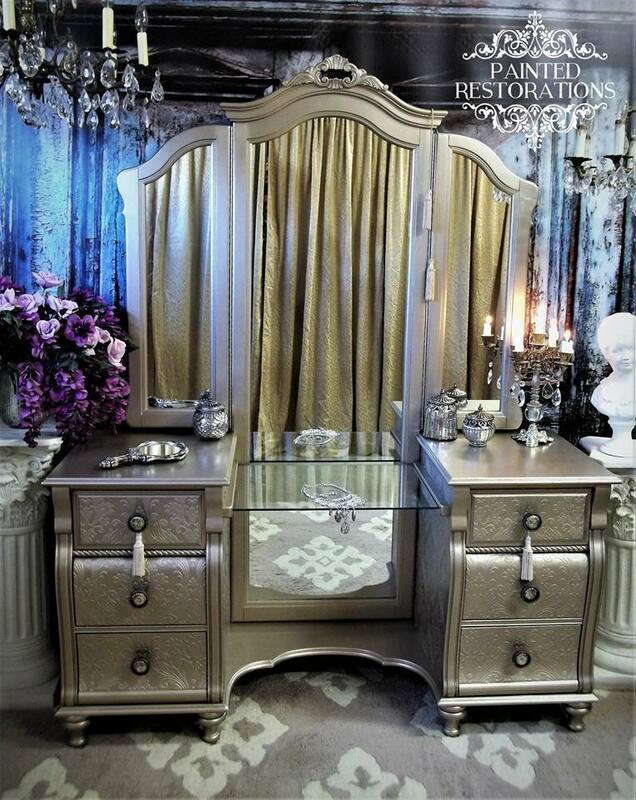 There is something so implicitly glamorous about a vintage vanity. Without fail, it always has me picturing a 1930’s film starlet. You know, all wrapped in a feather boa, primping under a lighted makeup mirror . Because Vanity is about pride in appearance, it’s the perfect name for the place we use to get dolled up! When did beauty routines become so involved, that ladies were like “Yeah, I’m actually gonna need another piece of furniture for this”? As it turns out, the vanity table has always been a status symbol of attractiveness. In fact, no other piece of furniture worked so hard to keep up with our changing societal trends, and #beautygoals. And what’s more, these tables actually have a really interesting history as a gal’s favorite piece of furniture. So whether you’re a vintage vanity lover or have a more mod taste, it’s pretty fun to see how our beloved beauty treasure chests have kept up with us. 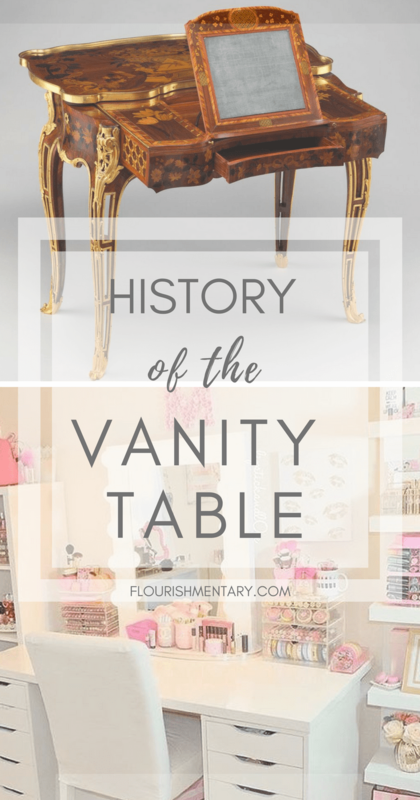 And If you happen to be hunting for the perfect vanity, I’ll show you which styles survived the changing times, and how you can snag the perfect vanity style in your own home! Okay, so lets just come out and say this. Humans have always been inventing tricky ways to appear better looking than they actually are. Shocking, I know, but pretty much as soon we saw our reflections in a muddy puddle, we invented clever ways to go from hurt to hot. Way back before the Kardashians (probably) tried to trademark contouring, ancient Egyptians stored their rare eye makeup colors, perfumes, and oils inside super fancy and ornately decorated boxes. Egyptian women guarded these as some of their most prized possession. Given how easy it was to get tossed in the Nile back then, you wouldn’t dare mess with her sacred beauty stash. Maybe because society was advancing super slowly, or because women were too busy trying to prove they weren’t witches, but nothing really innovative happened in the beauty storage game for quite a long time. 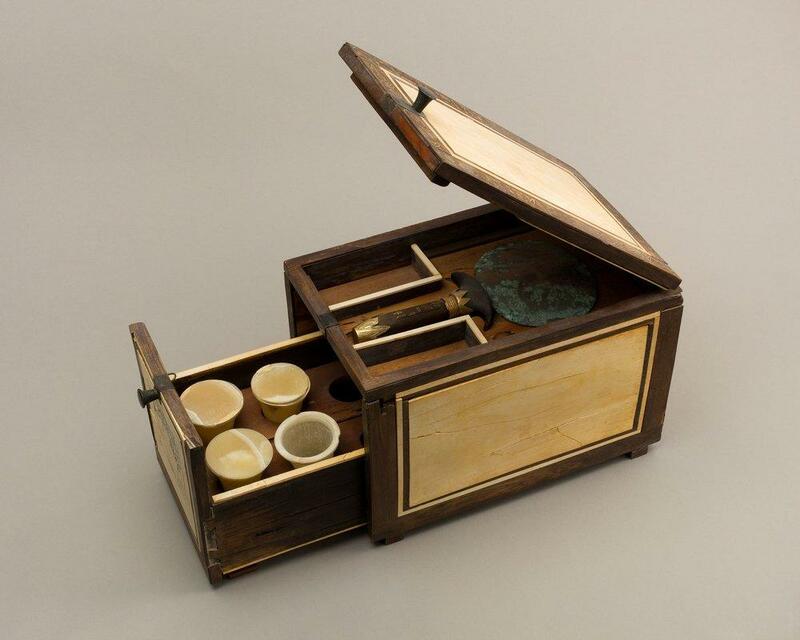 As the years went on, these cosmetics treasure chests simply became more ornate, with intricate compartments and fancier handles, but not much else changed. Finally something interesting started to happen, around the late 17th century in Europe. The beauty revolution was spreading like wildfire, so the once basic beauty boxes were retired in favor of something bigger and better. 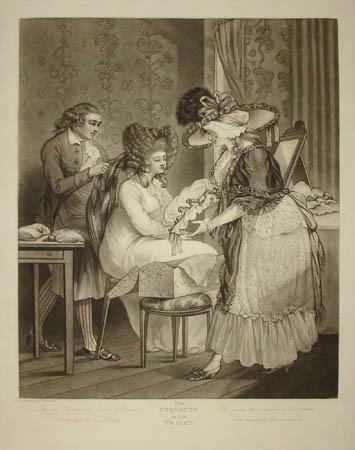 By that time members of high society were indulging in some insanely lengthy beauty rituals. I’m talking intricate clothing with a bazillion buttons, hairstyles way bigger than people’s actual heads, and of course, heavy clown makeup. Oh, and that wasn’t just for women. Men were also expected to jump on the train of lavish dress and excessive style. Royals went through these tedious grooming routines daily, without even being able to scroll through their instagram feeds to pass the time. I’m sure that no celebrity today would be able to endure that level of boredom. Fortunately these aristocrats were constantly surrounded by their court (aka: squad). These little cliques were always on standby, so reigning ladies started turning their boring beauty rituals into fun hang out sessions. These highborn women were longing for a space where they could chit chat while being glammed up. Naturally they turned to renowned furniture makers to come up some with some creative solutions. Drawing inspiration from the popular mens shaving tables, and low boy tables, designers came up with some stunning concepts. The end result was a piece of furniture where you could entertain friends, catch up on writing, and most importantly, store vast collections of powders, cremes, and wigs that noble ladies needed to look like a circus performer impressive. Early vintage vanity tables were known by the lovely name “Toilet Table”. And I know what you’re thinking but no, not because people did their business in them. 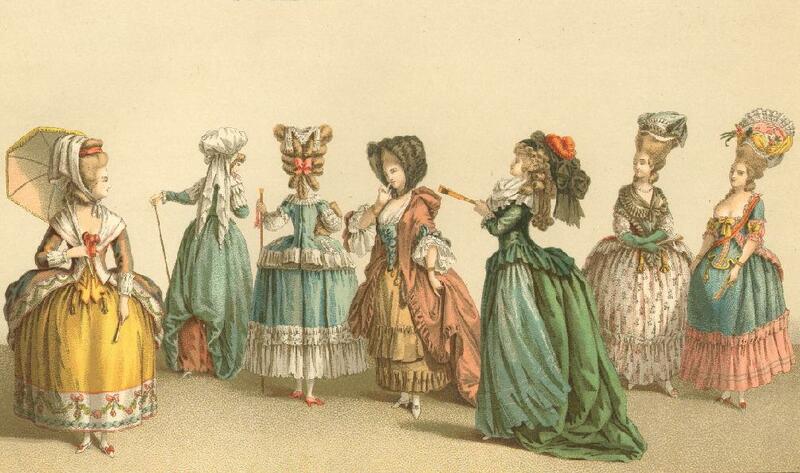 The term comes from the french word ‘toilette‘ which was a cute little handkerchief cloth. Ladies used them to wrap up their most delicate cosmetics before storing them away. Since plumbing wasn’t mainstream, some vintage vanity tables were designed with a compartment for a small water basin. The heavy handed makeup of the 1700’s was a pain to remove, so it was ideal to have a place to wash your face. Those were the days before makeup wipes, so you’ve really got zero excuses to pass out with a face full of makeup nowadays. 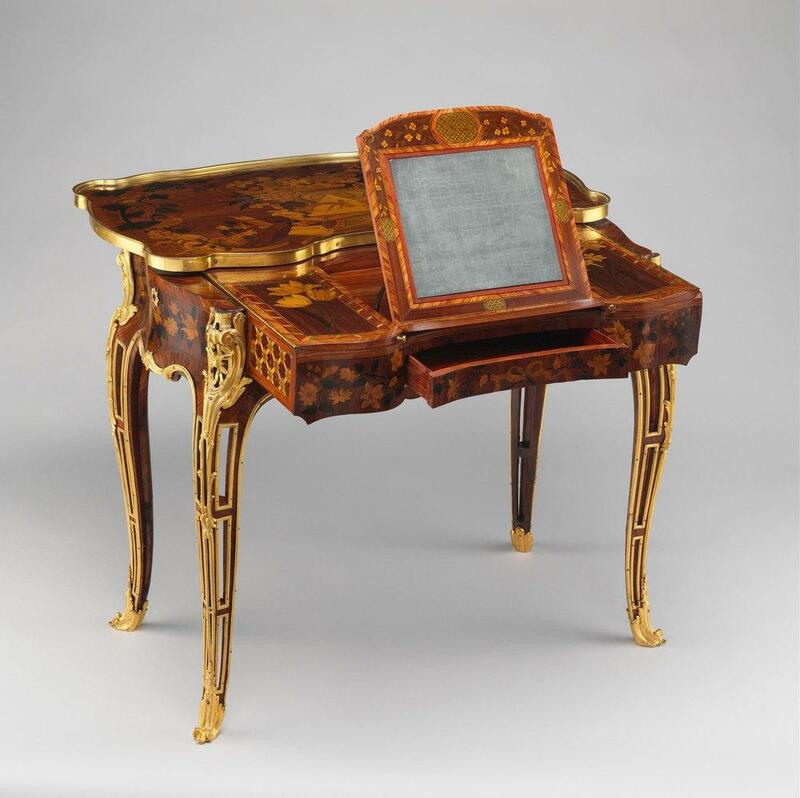 One of the most amazing examples the early French vanity table, belonged to the famous Madame de Pompadour. She was best known for being the mistress of King Louis XV, but she was a totally iconic and respected lady in her own right. Before Marie Antionette was rambling on about cake, Pompadour was influencing popular taste through her status at court. 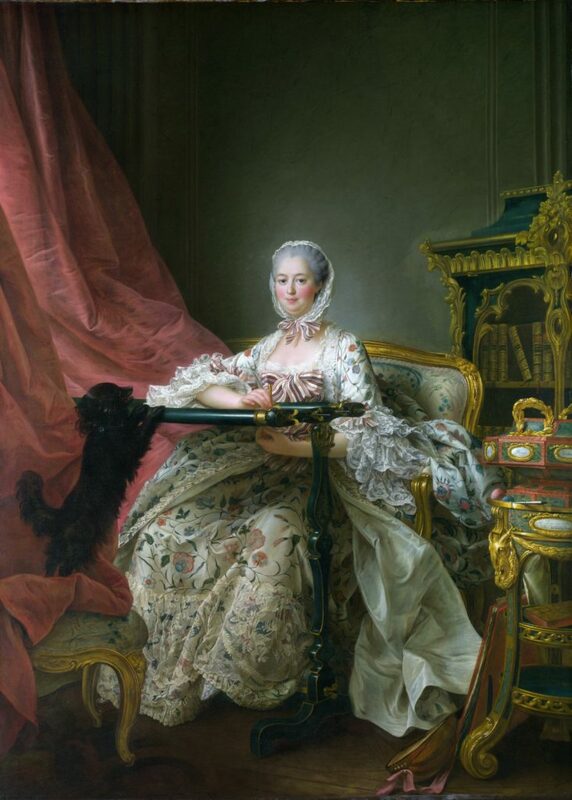 Madame Pompadour was a trusted adviser to the King, so she was obviously like really busy most of the time. She became annoyed that she was held up for hours during her beauty routine or ‘toilette’ as the Frenchies were still calling it. It was difficult for her that she couldn’t get any of her important matters checked off while waiting. As an unofficial minister of the arts, she commissioned renowned furniture designer Jean-Francois Oeben to make a vanity table where she could carry out all of her tasks, in the ultimate style. His creation was a Rococo style vanity, that’s as much a functional marvel as a work of art. This gorgeous dressing table is adorned with dainty flowers, and even features a tower motif inspired by the Pompadour coat of arms. Oeben artistically engineered the mechanical vanity so that when the top slides back, the front moves forward revealing a HUGE (for the time because glass was pricey) mirror. The sliding mechanism extends the surface area, leaving plenty of room for visitors to pull up a chair other side. It’s also got some concealed storage compartments, perfect for hiding away little objects. For Madame Pompadour, it was a gorgeous place to visit with her gal pals, correspond to letters, and store her beloved cosmetics. 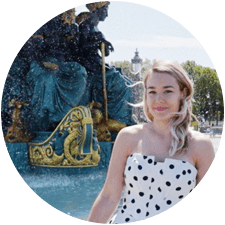 Oeben’s vanity perfectly represented her interests and skills, and also encapsulated the societal trends of her era at the Palace of Versailles. 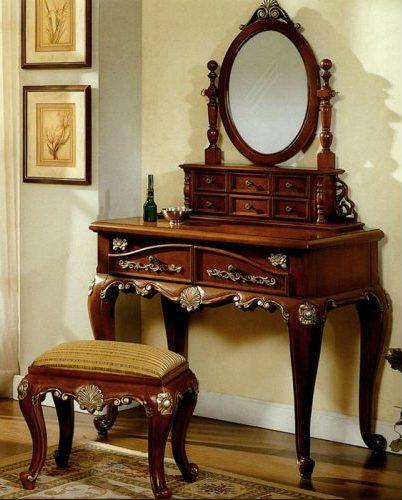 Pompadour was well known for receiving all types of guest while sitting at her elegant dressing table. Her vanity became the new GOALS, and inspired other women to continue on with the seated tradition. 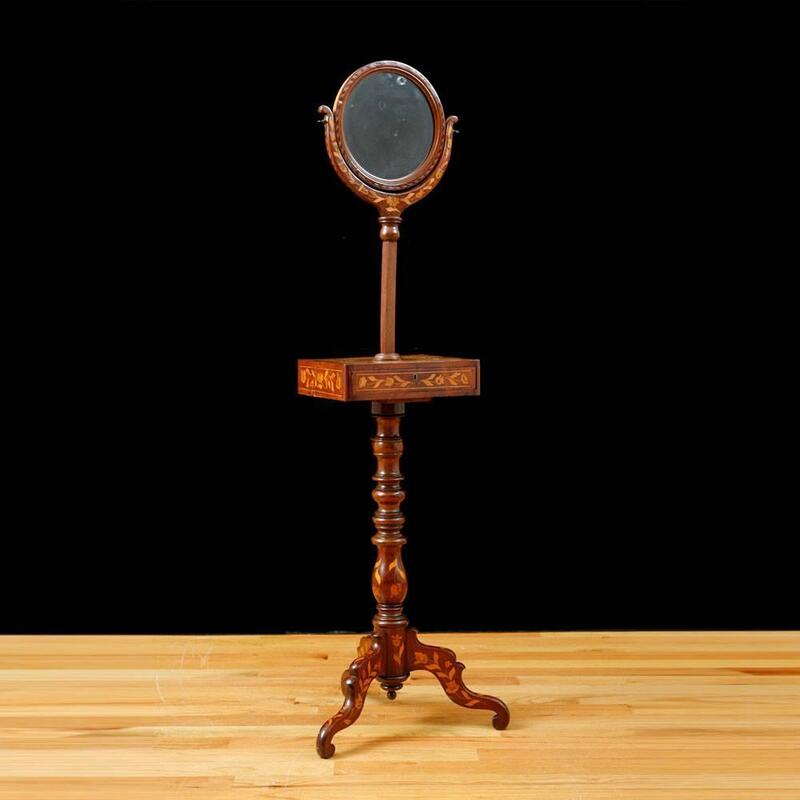 By the 19th century, the vanity had floated its way over to Victorian England and America with a newly classed up name; the dressing table. They had slowly become a crucial part of the standard bedroom suite, and furniture makers used dark oak, walnut, and mahogany to make trendy matching sets. Queen Anne style vanity tables became all the rage, but were less flashy than their previous french ancestors. These dressing tables had chic cabriole legs with an S curve, but lacked the over the top ‘Rococo’ style flair that was a total must have years before. Glass had become easier and less expensive to make by the 1900’s, so ladies were ready to see themselves on a full size scale. The once delicate small mirrors grew to take center stage of these vintage vanity tables. 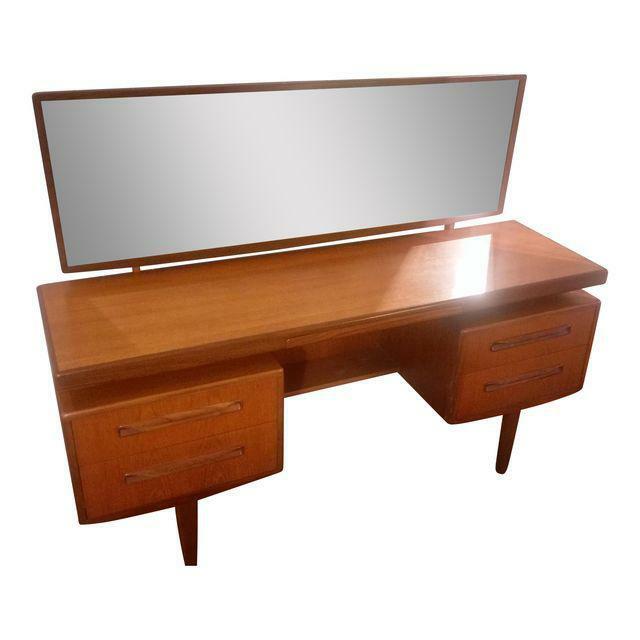 The Tri Fold Mirror vanity table was the next popular style to be seen in homes everywhere. It featured a central oval mirror, and two smaller “wing” mirrors on each side. Some of these wing mirrors even folded inward so that you could get a 360 view of your primping efforts! 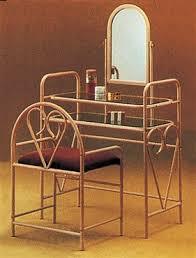 By the 1930’s the art deco movement was in full swing, and with it came big changes to the vanity table. The Waterfall vanity was a less elaborate design, with an even larger circular mirror and fairly simple details. Waterfall vanities were covered in exotic veneers that ran the short length of the surface. It created that trademark waterfall edge that vintage vanity enthusiasts still go crazy for today. In the 1950’s, mid century modern decor took over. The once curvy pieces, became rigid with very sharp, clean lines. The mirrors above these vintage vanity tables also adjusted, swapping the oval for rectangular shaped designs. The legs on mid century vanities became thin little sticks, and remind me of those triangle peg in the hole games you play at Cracker Barrel. Needless to say they aren’t the prettiest, but the sleek style was a welcome change in that era. In the 1970’s furniture designers had begun to experiment wildly with different shapes and materials for vanity tables. They used satin pine, metals, and lighter colored materials to finish off these interestingly shaped designs. Kinda makes sense that the 70’s is “the decade that taste forgot”, because they had some seriously heinous looking vanity tables. 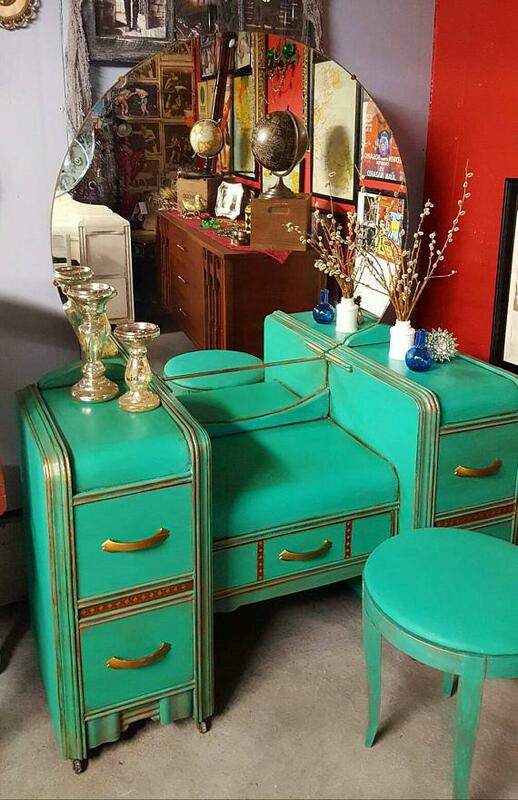 On the up side, since the cosmetics industry had grown, these vintage vanity tables incorporated more storage to keep up with the bigger hairspray collections. 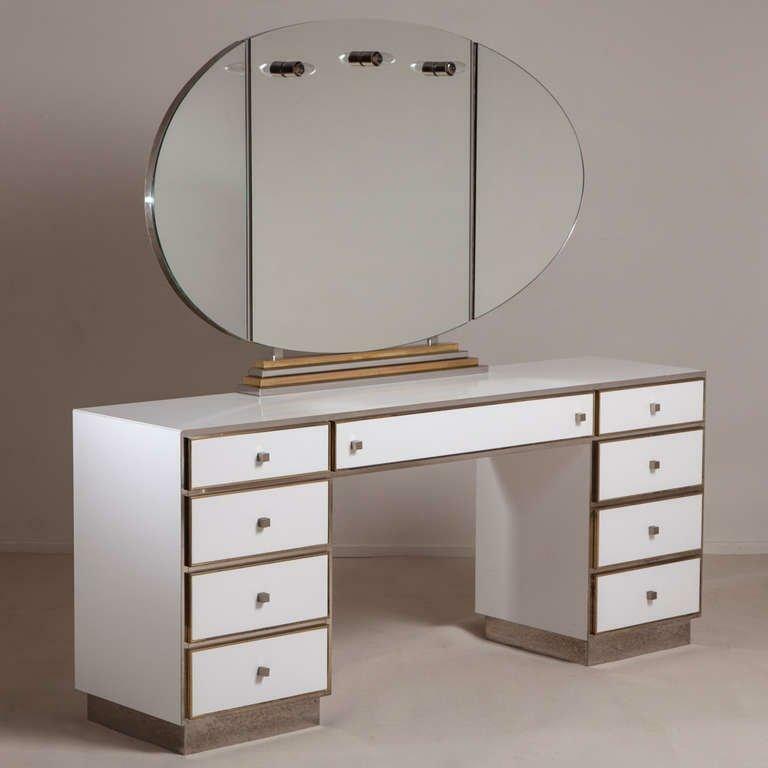 The 1990’s brought in contemporary designs and streamlined the look of the vanity. Acrylic materials, and glass topped vanities were all the rage. It also brought in the trend of clear trays, and organizers, becoming the ‘en vogue’ way to store beauty goodies. Oh, and brass coating was on EVERYTHING for some reason, including vanity tables, and it was not cute at all. At the start of the 2000’s contemporary vanity tables with futuristic designs showed up on the scene. They had some pretty interesting finishes, like colored lacquers and shimmering effects. All over mirroring was another popular vanity style, which probably came in handy for blending that pesky foundation line under your chin. Vanity tables completely capitalized on the Y2K millennium look, and were a nod to the glitter obsessed era trend. It wasn’t long before vanity styles shifted again, this time drawing inspiration from the past. 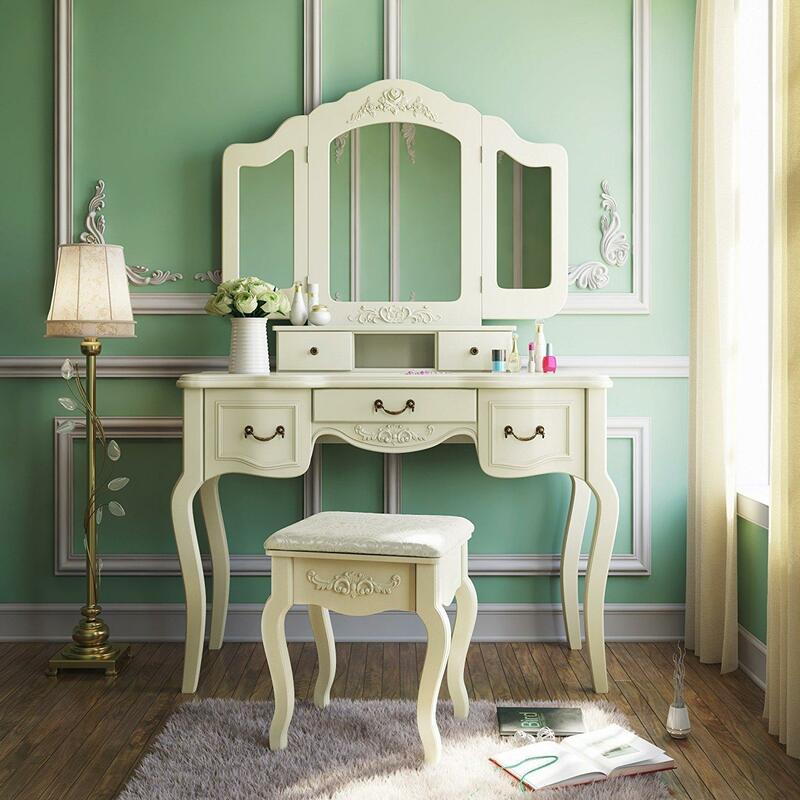 In the late 2000’s french provincial and victorian designs got a facelift, giving new life to the vintage vanity. With interior design trends of shabby chic and french farmhouse taking over, these reproductions are still wildly popular today. The biggest update for modern vanity tables, is that they sprawl across whatever space they occupy. It’s pretty common for them to take up a wall, closet, or even an entire room. Vanity closets, and vanity rooms are new trends that are showing no signs of slowing down. Serious makeup lovers are even installing shelving systems, and additional drawers around their vanities to contain their treasure troves. This shift in design goes right along with the explosive growth of the beauty industry in the past few years. 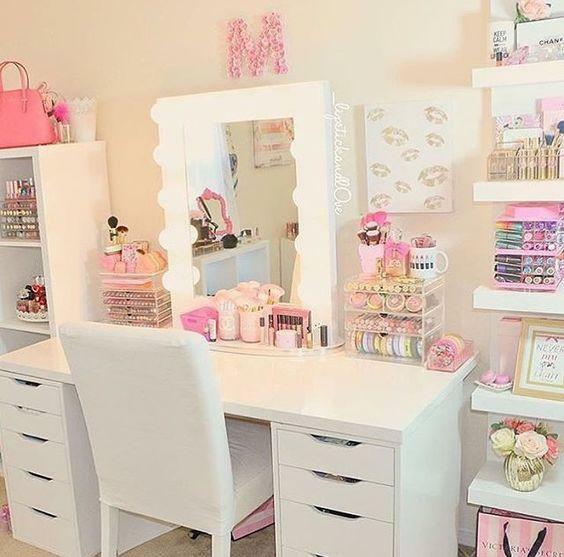 This boom paved the way for makeup artists attaining social media stardom by sharing pics of their enviable collections. The most popular style, is a girly glam mix seen all over Pinterest. These vanity tables are usually a simple white desk, with deep drawers. Completing this look is usually a glamorous light up vanity mirror like this, and a set of these narrow column shelves. Much like Madame Pompadour inspired ladies of her time, beauty bloggers have inspired our modern vanities to have tons of storage. Today’s ladies are fortunate to have more options when choosing furniture styles, thanks to a little thing called the internet. Equally as important as choosing a style you’ll love longterm, is choosing an one that fits your storage needs. Here are a few suggestions of vanity styles that will check both your boxes! Modern furniture brands make gorgeous reproductions, and real vintage pieces are easier to find than ever. Sites like Etsy, and Charish have authentic pieces from any design period a girl could dream of. Some of my favorite vintage vanities are repainted to give them a modern shine, like this dazzling design via Painted Restorations. While I’m partial to the romantic designs of vintage vanity tables, they don’t always provide the most storage space. Make sure you’ll have your storage needs covered by a few simple drawers if you’re opting for one of these more dainty makeup tables. 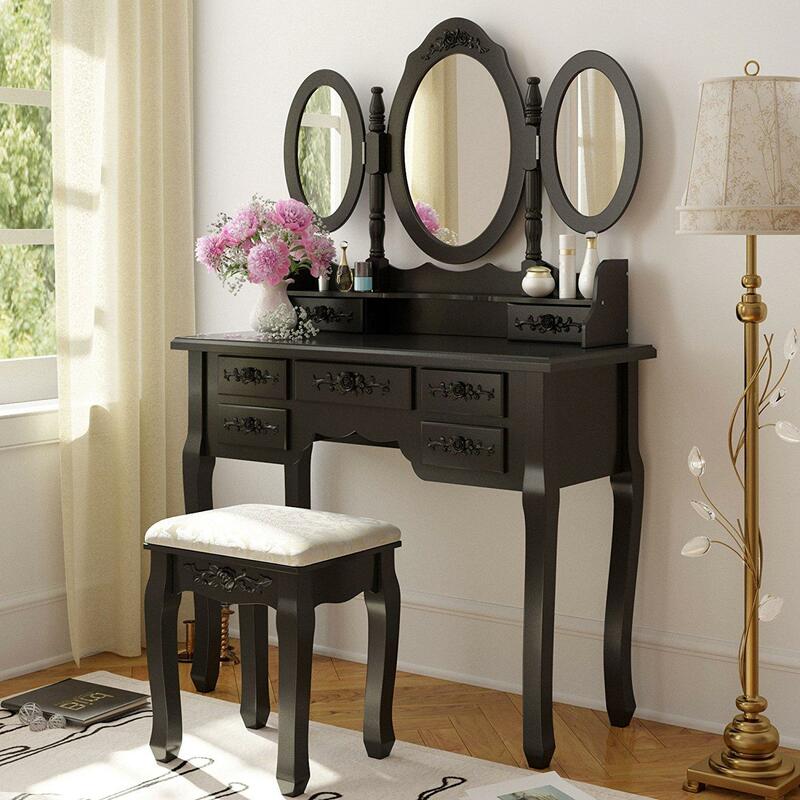 If you are more of a makeup minimalist, opt for a style like this vanity table with a few drawers, and a simple mirror. You can even choose a style that doubles as a desk for a home office. 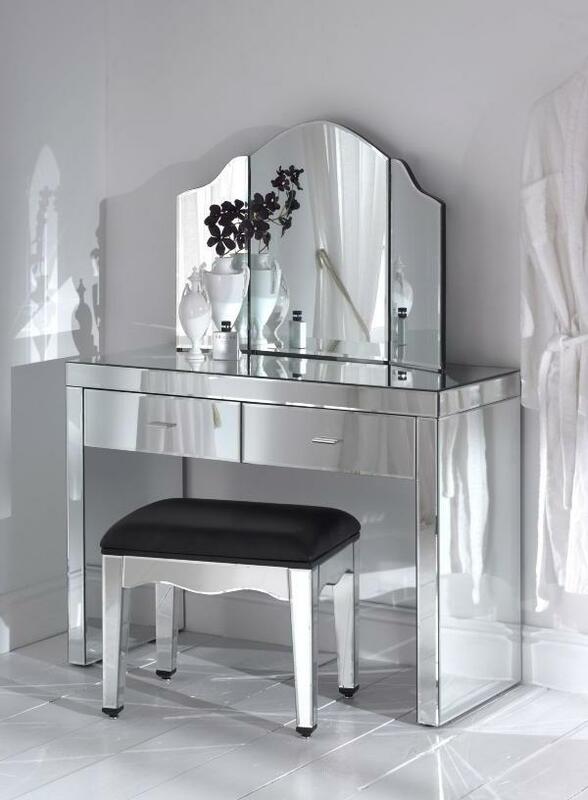 If your vanity is gonna work double duty, choose a style with a lift up mirror, or use a lighted makeup mirror. I have one at my desk/vanity combo so that I can easily move it out of sight. If you have a more moderately sized beauty collection there are tons of options. Look for a vanity table with several drawers, where you can organize items by category. You can find them in classic vanity table styles, or some with a more modern twist. Make sure the surface area is large enough for some helpful beauty storage organizers. You can also make it easier to find the things you use daily, by stashing them in a separate compartment of these clear cosmetics organizers. 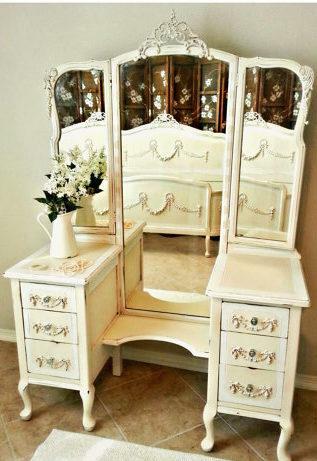 If you’ve got a large collection, you can even put together the vanity of your dreams. Start with a base made from a set of these office storage drawers. Next top the drawers with a simple table top, and add a glass cover if you’re feeling fancy. You can add a glam light up vanity mirror, and finish the look out with some of these vertical shelving units to complete the space. Don’t forget to jazz up the look with some cute vanity accessories, and you’ve got a Pinterest worthy, DIY custom vanity fit for a beauty queen. If you’re not into the simple DIY vanity look, you’ve got plenty of options with built in storage. Choose a set thats got plenty of deep drawers, but also has surface area if you want to add some personal touches down the road. 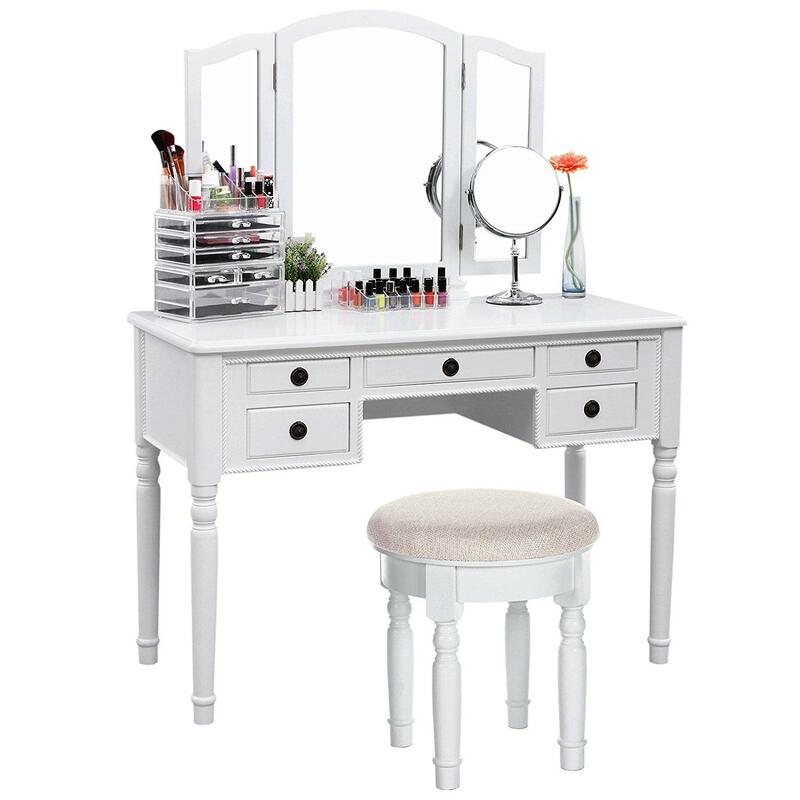 This Hollywood vintage vanity style has a classic look that always be super chic. The old saying goes “form follows function”, and the vanity has perfectly showcased our devotion to beauty over the years. 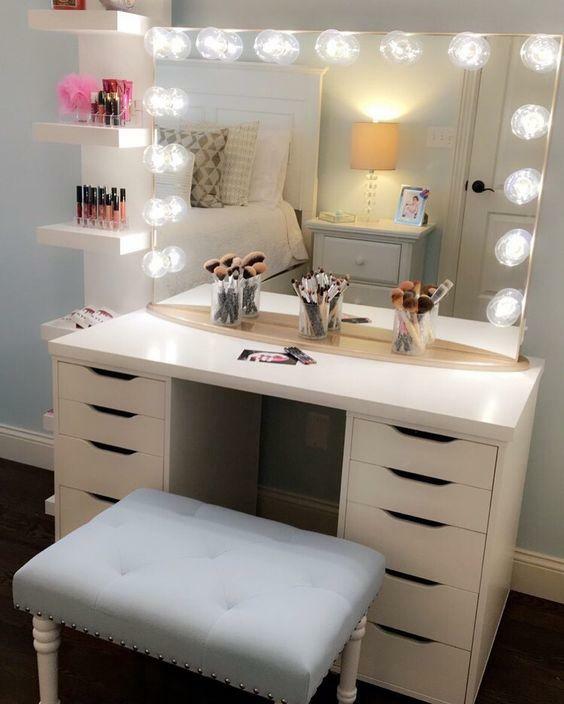 In the future, the DIY vanity will continue to be popular, because you can customize your size as your makeup collection grows. 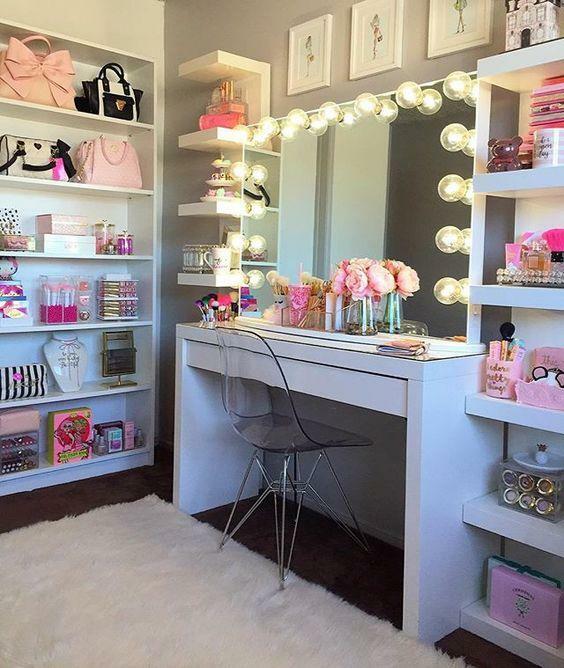 Beauty walls, closets, and rooms won’t slow down, because makeup is such a popular hobby for ladies across the globe. So which of these lovely vanity styles is right up your alley? Let me know in the comments which style is your favorite! 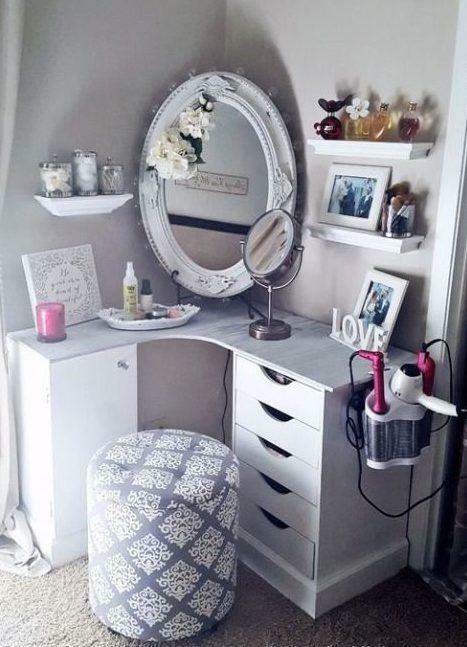 And if you’re looking for some vintage vanity inspiration, make sure to follow Flourishmentary on Pinterest and check out the ‘Vintage Vanities & Makeup Table Ideas‘ board! I use my grandmother’s treddel sewing machine. The drawers are small but I don’t wear a lot of makeup. I protect the top with a scarf and use a lighted mirror. Looks good and works for me. Hey Marsha! That is such a cool and unique idea for repurposing an antique- Thanks for sharing! This was a lot of fun to read – and I don’t even wear makeup! I really enjoyed the history and seeing all the different forms the vanity has taken over the centuries. Thanks so much Kyla! It was super fun to research and put together! This was a fun little read! I’ve been looking for a vanity to buy and it was nice to have names to go with the styles I’ve been seeing! But, I’ve been trying to figure out why some of them have such a low “desk” part in the middle. Like if you were sitting down it would hit your shins! I don’t really understand why and haven’t found an answer. Did you come across anything in your research? Hi Dalia! So glad you’ve enjoyed it! Those styles were very popular in the 40’s, and I believe that people used small stools under their vanity tables instead of a traditional chair! Not really sure why but it’s a cute look! Best of luck finding your perfect match! I thoroughly enjoyed reading this and seeing the styles, that one from the 1990’s was hilariously fugly!!! Hahah yes it totally was! Thanks for reading! You may find my table a bit more inspiring, here: https://www.youtube.com/watch?v=aHCQ4C9A6AY&t=2s Until recently, I had a store that specialized in luxury vanity table items such as the ones shown. Great read! My mother bought me an antique, trifold, vanity when I was in junior high school. It’s traveled back oveeseas with me as a army spouse. I’m turning 55 this year and I’ll be dressing it up in old Hollywood glam. Hi Shelly! That’s amazing that you’ve been able to keep it with you all these years! 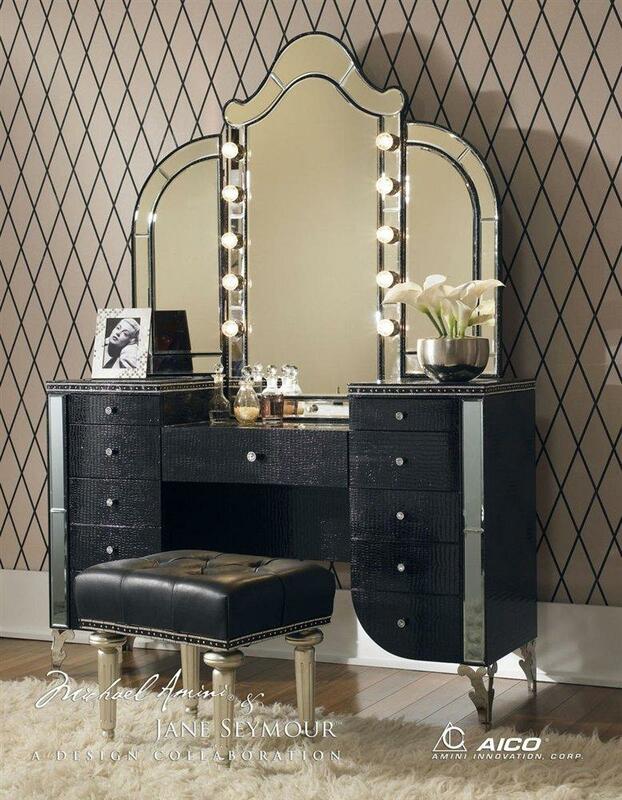 I am a big fan of that hollywood glam look for a vanity :;) Thanks for reading! Hi Helena! I found it so fun to learn about, and it’s so cool to see how they’ve adapted to make our beauty routines easier! As a MUA it’s so nice you have two! So glad you enjoyed it, and thanks so much for reading!